Woods attracts large, boisterous crowds, an anomaly in a game known for its whispering announcers. (CNN) -- For all but the die-hard few, televised golf used to be as exciting as watching grass grow. But then a phenomenon called Tiger Woods swept onto the scene, driving the sport of golf far beyond the confines of the stodgy country club set and into the realm of mass appeal. With his youth, good looks, mixed race and unprecedented dominance of the game, Woods sparked a boom in the world of golf, packing tournaments with fans and courses with newly inspired duffers. "The kid has done things over the course of the last five years that nobody has ever done in golf before and, to a certain extent, no one's ever done in sports before," said golf journalist Tim Rosaforte. Woods has been making golf history since the age of 15, when he became the youngest player to win the U.S. Junior Amateur Championship. In April 2001, at 25, he became the first player to hold all four major professional golf titles at the same time with his second victory at the Masters. Part of his appeal is the cool confidence he exudes when the pressure is on, making his achievements seem effortless. But years of painstaking practice are hidden within his easy swing, said his friend and fellow pro golfer Gary Player. "The average man, he looks at a man like Tiger Woods and says, 'Gee, all he does is play golf and make this money.' That is not true. It took years and years of sacrifice, and it's a massive sacrifice to become a world champion," Player said. Tiger Woods was born December 30, 1975, in Cypress, California, about 35 miles south of Los Angeles, to Earl and Kultida Woods. His given name was Eldrick, but his father called him "Tiger," the nickname of a Vietnam War buddy known for his bravery. His dad later explained that he hoped his son "would be as courageous as my friend." Earl Woods, who is part African-Amercian and part Native American, served in Vietnam as a Green Beret. While he was stationed in Thailand, he met Kultida, who is part Chinese, Thai and Caucasian. Golf is a lifelong passion for Woods, who started playing about the time he started walking. By the time young Woods was walking, his father had already introduced him to the game of golf. He shot a 48 on a nine-hole course by the age of 2. 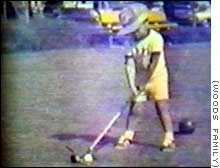 In 1978, the toddler prodigy appeared on "The Mike Douglas Show" in a putting contest with comedian Bob Hope. In spite of his talent and the media attention, Woods said that at age 4 he was turned away from a local golf course because of the color of his skin. "To be judged just because of the pigmentation of my skin," Woods said, "I found that very difficult at first because I did not understand it then. As I grew up, I started to understand it and talked to my father about it. I think those types of experiences have spurred me on." "How do you explain that? He was only 4 years old," Earl Woods said, recalling the incident. "You tell him what it is, you tell him to be proud of who he is and not let anyone define who he is." Woods' father taught him golf technique throughout his childhood, while his mother stressed discipline. At 16, he had amassed six junior tournament victories and qualified to play in his first professional tournament as an amateur golfer. His teachers at Western High School in Cypress remember him as being a studious, punctual student who obeyed all the rules. He participated in every seniors' rite of passage, including the prom, despite his devotion to golf. "This was probably the last time he was able to be a normal man," said drivers' education teacher Bob Fieldhouse. "He was able to do things here that teen-agers should do. And he did them all." Woods enrolled at Stanford University on a golf scholarship. "I wanted him to get his education," Earl Woods said. "The only thing better than a good person is an educated person." At Stanford he was treated like every other freshman on the golf team, including having to go through initiation. Notah Begay, a pro golfer and former Stanford teammate, recalled what he told Woods on the first day of practice: "Tiger, you're going to be the strongest freshman in the Pac Ten, maybe even in the country. And not only because of your golf, because you are going to carry our bags when we go on road trips." Woods won his first Masters in 1997, becoming the youngest winner ever and the first person of Asian or African heritage to hold the title. Nick Faldo assists with the green jacket. Woods left Stanford and turned professional in 1996 at age 20. Shortly afterward, he signed a $40 million promotional deal with Nike and a $20 million deal with Titleist. "You could see that we were experiencing something that was unique and different -- not only from the standpoint of what he was doing socially to the game, but what this young man could do competitively and as an athlete," said Rosaforte. A year after he turned pro, Woods won the Masters, becoming the youngest player and the first person of Asian or African heritage to hold the title. Woods held his cool throughout the tough match. After he completed his win, golfer Fuzzy Zoeller said the following about the new star: "Pat him on the back. Say congratulations ... and tell him not to serve fried chicken next year ... or collard greens or whatever the hell they serve." The comments caused an uproar in the golfing world, an arena known for its civility. Although Zoeller denied that his remarks were racist, Woods said he felt that he needed to respond to them. "I found out some things I needed to know, and I let him know how I felt," Woods said. "Hopefully, I won't have a situation like this ever again, but that's highly unlikely. But I know one thing that remains stable: I love golf." In 1998 Woods went through an 11-tournament losing streak but rebounded with a new swing in 1999. By November of that year, he became the first golfer in 25 years to win eight PGA events in a single season, including the PGA Championship. He took home more than $6 million in prize money -- a record amount of pro-golf earnings for a single year. In 2000, Woods won the U.S. Open, the British Open and for the second year in a row, the PGA Championship. In April, he capped his winning streak with victory at the Masters, making history with his sweep of the four major golf titles. Woods finished the 2001 season ranked number one in the world, and won his third straight PGA Player of the Year award. Woods loves competition and shows no sign that he may want to take it easy although he leads the career money list with $28 million. Last year he earned about $54 million in endorsements -- an estimated $9 million more than basketball star Michael Jordan earned during his prime season. But with fame and fortune, there are downsides. Woods, like many other ambitious celebrities, suffers from a lack of privacy and free time. "I wouldn't want to be Tiger Woods," said Rosaforte. "I wouldn't want to have the type of fame he has, where he can't go to a restaurant, where he has to make arrangements to go through a back door." Woods tries to put the media attention to good use. 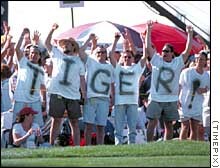 In 1996, he started the Tiger Woods Foundation to provide scholarships and access to golf courses to inner-city youth. He has hosted 25 clinics over the past five years to teach underprivileged children about his favorite sport. "America's a melting pot, all races, cultures, religious choices," said Woods. "I want our sport to reflect how America is -- any kind of diversity you can imagine is here in the United States and that's how I want our sport to look. If they choose to play, they should not be denied any access to that experience." The sport is forever linked to the name of Tiger Woods, just as he said he is linked to the sport. "Golf is me," he said. "Golf has made me and shaped me into the person I am here today."